It’s beginning to look a lot like Christmas! 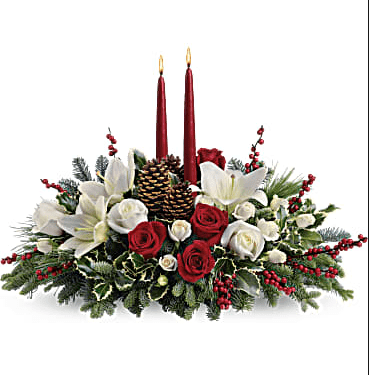 Add a warm glow to your holiday décor with this lush arrangement of fresh red roses and other blooms in season. A beautiful Christmas centerpiece with its classic glass hurricane and red pillar candle, it also looks lovely on a mantle or entry table. Fragrant noble fir and seeded eucalyptus, cedar and other seasonal greens are the green backdrop to red roses, red carnations, red berries and festive Christmas ornaments.